This wonderful picture of Job Greatorex's Harvey Dale quarry and the advertisement below were amongst the last of the images the late Kenneth Smith gave me from his extensive collection. We dated the rare photograph to around 1900, though it could have been taken marginally earlier than that. The sign for J. Greatorex & Son sign can be seen opposite the iron footbridge over the Derwent and the building where the limestone was crushed was just to its left. There are several piles of crushed limestone in front of the building. Until 1895 Greatorex & Son used gunpowder for blasting the rock but they then applied for a license to store gelignite, a new explosive, which, they said, was twice as powerful as gunpowder. In 1903 there were two extensive rock falls at the quarry. One gentleman, a Mr Taylor (a lighting contractor) had a narrow escape when one of the small pieces of rock flew across the road and pierced his hat. Job Greatorex died on 20 May 1905, aged 76, leaving the business in the hands of his youngest son Alfred. 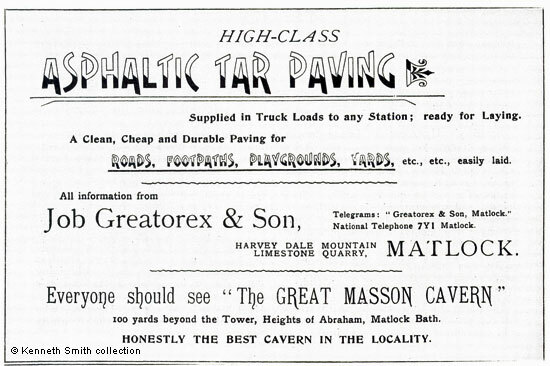 The Great Masson Cavern was shown by Alfred Job Greatorex up until at least 1912. In 1914 Messrs J Greatorex & Son charged 2s[hillings]. per ton for broken limestone. When they were approached by the Urban District Council after the war (1920) to supply the same material, they tendered for 7s. a ton for broken limestone. This caused the Matlock Profiteering Tribunal to prosecute them despite Greatorex & Son withdrawing their quotation. At the end of 1918 prices had been fixed under State control but the increase in the cost of explosives, oil and wages in the following year had been enormous. William Shaw, of the adjoining Holt Quarry, was already supplying the Council with the same material for 5s. a ton, although when he was asked about the price he said that he made no profit from the contract; when asked why he responded that it was "better to have half a loaf than none at all". Mr Hadfield, who was secretary of the Matlock branch of the Union of General Workers at the time, stated that the rate for time workers in the quarries was 1s. 3d. hour, and for piece workers 9½d. a ton, but that in Greatorex's quarry the wages varied from 1s. to 1s. 2d. per hour, and 9d. a ton. The Tribunal decided that 5s 6d a ton was a reasonable price so decided to prosecute. J. Greatorex and Son made two important purchases in 1930, one in January and the other in November. They first bought Thomas Shaw's quarry and later bought the one belonging to Alfred Shaw, giving them three quarries next door to each other. At the same time as they made their second purchase they completed an agreement on the Platts Estate, giving them 18½ acres of quarrying land behind their existing holdings. 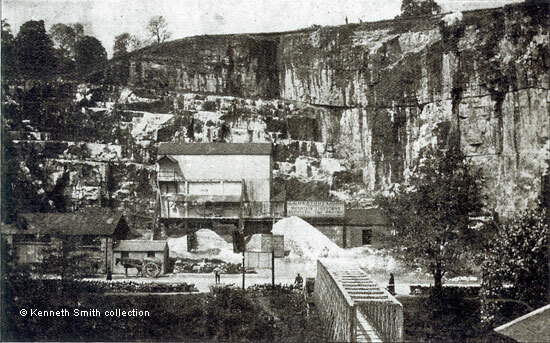 During the 1930s the Council received several complaints about the quarry and had to write to the owners. The first was concerned with the dust created; Captain Harry Douglas observed that the trees nearby looking as if there had been in a snowstorm! The second, made by property owners nearby, was about fumes emanating from their works. J. Greatorex and Son were still trading under the name in 1941, but had become part of Derbyshire Stone at the end of 1935. Alfred Job Greatorex of Commonwood, Cliff-road died on 10 Nov 1943. Both images from a small booklet of Derbyshire views. No publisher. No date, but about 1900. Images in the collection of and provided by and © Kenneth Smith. "Derby Daily Telegraph", 18 January 1895. "Derbyshire Times and Chesterfield Herald", 24 January 1903. The first fall was during the night and the second occurred on a Sunday morning. "Many tons of stone fell in this way". Fortunately, nobody was injured. "Derbyshire Courier", 28 February 1920. Limestone Prices. "Derbyshire Times and Chesterfield Herald", 4 January 1930 and 8 November 1930. "Derbyshire Times and Chesterfield Herald", 20 May 1933. Dust Nuisance. "Derby Daily Telegraph", 28 June 1939. "Kelly's Directory of Derbyshire", 1941. "Bath Chronicle and Weekly Gazette", 28 December 1935. Derbyshire Stone, Limited, had just been formed to take over all or part of the businesses of Constable Hart and Co., Ltd., and John Hadfield & Sons Ltd., and not less than 90% of the issued shares of Greatorex and Son, Ltd., the Hartington Quarries Ltd., and the Hopton Wood Stone Firms. Also "The Times", 12 Jun, 1936. Notice of shares, Derbyshire Stone Limited.